"Terry Ellis is a model for young preachers: in writing, thinking, and especially preaching. These weekly columns on grace demonstrate his skill with language and his insight into things of the spirit. Read them regularly, like I do, and they will bless you." 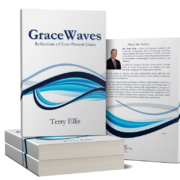 "Terry Ellis’ words, whether written or spoken, touch the heart,challenge the mind, and inspire appreciation for God's amazing grace." "In today’s critical and punitive society, Terry Ellis refreshes us with the true meaning of the beautiful grace of God, not only as a gift to be openly received but an offering to be lavishly shared. Terry truly has a personal understanding of the Grace of Christ and the ability to convey the concept in practical ways." “GraceWaves is rich in teaching, challenging and refreshing… grounded in Biblical theology. In the winters of my life, GraceWaves warms my soul, and in the hot dry summers, GraceWaves is like a fresh cool breath from God. Each week, Terry helps me to receive a new understanding of God, His grace and how I am to be gracious to others. "Each week, I look forward to reading the latest words of encouragement and hope from this gifted writer and colleague. They are just what I need to hear and share with others."